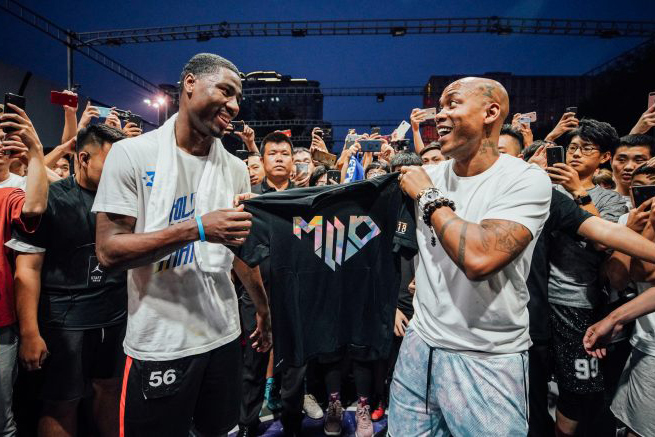 FIU alum Tymell Murphy (Left) was awarded MVP Honors by Stephan Marbury (Right) in Zhoushan, China in July 2018. Photo contributed by Tymell Murphy. SEAS alum, Tymell Murphy, fulfilled his life-long dream of playing professional basketball. Murphy played as a Panther from 2012-2014 and was considered a force to be reckoned with during his college career. After graduating with a liberal studies degree in 2014, Murphy was drafted into the NBA G-League; however, he knew he had to play overseas to further his career. Murphy then took the opportunity to play professionally in Asia. He played in Japan with their Kagophima Rebnise team from 2016-2017 and since then has been playing in China, where he has made a name for himself. While playing in a tournament in Zhoushan, China in July 2018, Murphy scored a total of 95 points for his team, and not only did his team win the tournament, but Murphy was awarded MVP honors for his performance through the games. As a left-hand shooter, Murphy studied other players, like Spurs legend Manu Ginobili, to perfect his technique. His most praised player and inspiration is none other than Michael Jordan. Despite being 28, Murphy’s ultimate goal is to eventually rejoin the NBA further along in his career. To catch up more on Murphy’s basketball career, read the full article on PantherNOW.